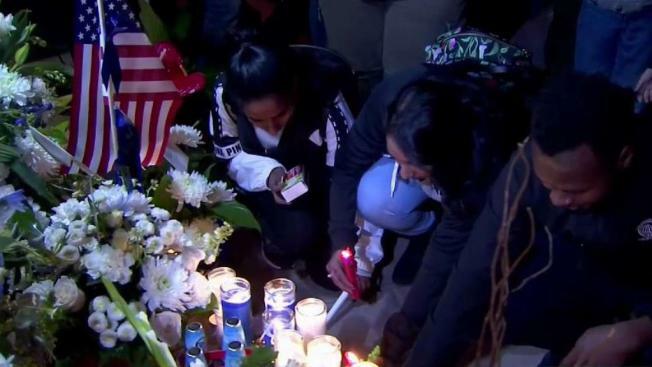 Hundreds of people gathered in the Newman Town Plaza to pay tribute to Officer Ronil Singh, hours after the suspected killer was captured. Sergio Quintana reports. The man suspected of gunning down a Newman police officer during a traffic stop Wednesday was captured in Central California following a three-day manhunt, Stanislaus County Sheriff Adam Christianson said Friday. The suspect, identified by the sheriff as Gustavo Perez Arriaga, 33, is accused of killing Cpl. Ronil Singh. Arriaga was arrested on a murder warrant in a house south of Bakersfield, Christianson said during a Friday afternoon news conference. Kern County Sheriff Donny Youngblood said a SWAT team was preparing to raid the house when Arriaga came out with his hands up and surrendered. Authorities said Arriaga was trying to flee back to Mexico. Christianson said Arriaga was a native of Mexico and had been in the U.S. illegally for several years after crossing the border in Arizona. The sheriff didn’t say when that happened but told reporters Arriaga had known gang affiliations and two prior drunken driving arrests. Christianson blamed California’s sanctuary law for preventing local authorities from reporting Arriaga to federal immigration officials for the DUI arrests. If he had been deported, the sheriff said, Singh would still be alive. "We can't ignore the fact that this could have been preventable," Christianson told reporters, before asking why the state was "providing sanctuary for criminals (and) gang members. It's a conversation we need to have." U.S. Immigration and Customs Enforcement has not confirmed Arriaga’s immigration status. The agency did immediately respond to an email request for comment. California's sanctuary law limits cooperation between local authorities and U.S. immigration officials and has drawn scorn from the Trump administration. It includes more than 800 exceptions for violent crimes and felonies and bars police from asking people about their citizenship status. A federal judge upheld the law earlier this year after a Trump administration challenge. Adrian Virgen, Arriaga's 25-year-old brother, and the suspect's co-worker, 27-year-old Erik Razo Quiroz, were also arrested for lying to investigators, Christianson said. In addition to the arrest of Virgen and Quiroz, officials named three other people who have been detained for allegedly aiding and abetting Arriaga. They have been identified as Bernabe Madrigal Castaneda, 59, Erasmo Villegas, 36, Maria Luisa Moreno, 57. Upon arresting Arriaga, his girlfriend Ana Leyde Cervantes, 30, and brother Conrado Virgen Mendoza, 34, were also arrested for aiding him in evading authorities, sheriff's said. Standing alongside Singh's family, the sheriff thanked officers and deputies for working day and night to capture the suspect. During the media briefing, Singh's brother Reggie provided an emotional statement and said "I was waiting for this to happen," regarding the arrest. "There's a lot of people out there that misses him," he said of his brother. A vigil will be held Friday night to honor Singh. The Newman community is expected to gather at 6 p.m. at Newman Downtown Plaza to pay respect to Singh, who colleagues described as an American patriot. Newman Police Chief Randy Richardson fought back tears as talked about his officer at a news conference Thursday, saying Singh fought hard to serve his adopted country while the man suspected of killing him crossed the border illegally and is a "coward." Richardson said the department and its 12 sworn officers were grieving. Singh, who emigrated from his native Fiji, was shot at about 1 a.m. Wednesday after stopping a suspected drunken driver in Newman, southeast of San Francisco in the San Joaquin Valley. Investigators Thursday searched a farmhouse in the town of El Nido in neighboring Merced County but didn't find the suspect, authorities said. Singh, 33, was the first officer to die in the line of duty, Richardson said. English was Singh's third language and he had a thick accent but took speech classes to improve his communication, the chief said.